If you need the version Without Overflow, please check Model number HL8018ACP. Filter Function: The Removable Brass Strainer Basket can be taken-down, which not only is a collecting hair helper but also anti-blocking. You can remove it at any time to clean hairs. Improved Design: 1. 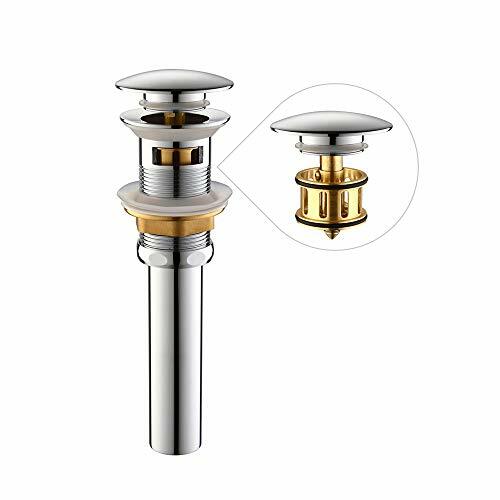 Thickening Brass Locking Nut help to install easier, which assists wrench in catching it firmly, shortening your installation time under the sink in the dark. 2.The Unique Plastic Washer help the underlying Silicon Gasket to upper shift evenly during installation as well as seal water more tightly. 3.Compared to knurled nut in almost pop up drain on the market, our Connecting Nut of The Tailpiece is more convenient for the wrench and easy to tighten. Installation Size: All of Hardware and Gaskets included, it fits sinks with 1 5/8"or 1 3/4'' drain holes, standard sized US plumbing. But NOT FIT for sinks with 1 1/2". Please measure the drain hole of your sink before placing an order. Premium Material: The chrome finished Bathroom Sink Drain is made of high quality solid brass and stainless steel (NOT PLASTIC),ensuring anti-corrosion and durability. Apply for Different Sinks: The Sink Drain WITH OVERFLOW is suitable for both vessel sink and undermount sink. Tips: Press to seal and press again to open. If you have any questions about this product by HOMELODY, contact us by completing and submitting the form below. If you are looking for a specif part number, please include it with your message.